I don't know how else to put it! We have had a lot of snow recently. Not NEARLY as much as some places, but a lot for us. And this cold. It is so brutal. When the weather is like this I will be honest with you, all I want is soup to eat. However, soup is not always a hearty and filling as I want it to be. Or is it? 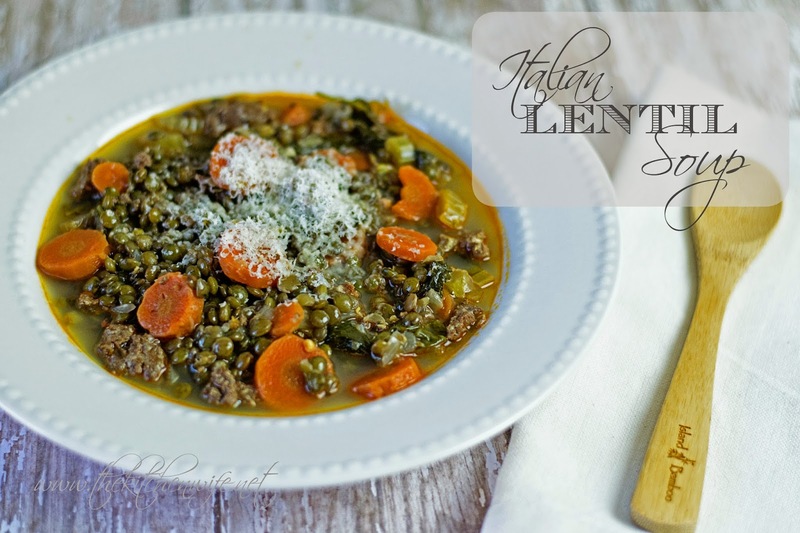 When I want something that is going to fill my belly and warm my soul during these cold winter days, I turn to my delicious Italian Lentil Soup. 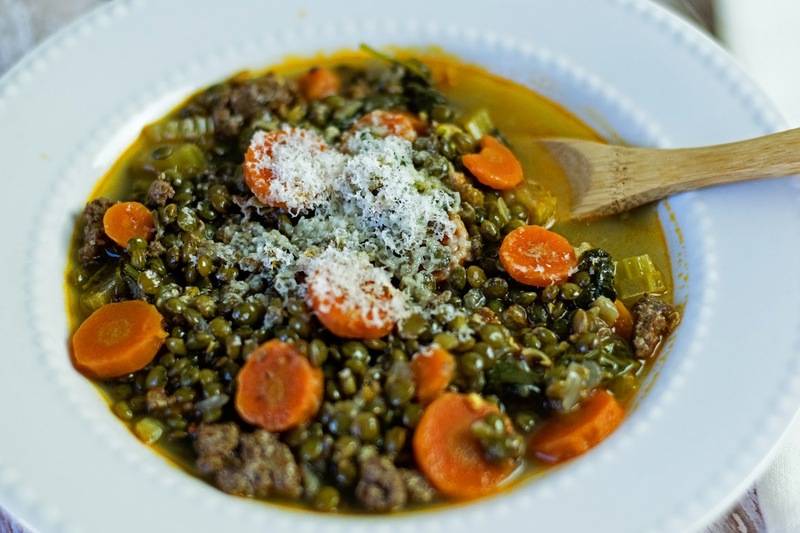 And with nutritious things such as lentils, Italian sausage, carrots, and kale, it not only warms my soul, but keeps my immune system boosted as well! You are going to love this soup, and I can't wait to share it with you! To begin, place a heavy pot over and medium/high heat. Add a little extra virgin olive oil to the pan, 1-2 tbsp. Once the pan is hot you can the onion. Allow the onion to cook until it begins to become soft and translucent. Now add the Italian sausage and cook until brown and no longer pink. We like a little heat in our soup so I used a spicy sausage. Feel free to use mild if you like. Allow the vegetables to cook until the begin to soften and you can smell the thyme and garlic coming from the pot. Now you can add the chicken stock or broth. Now bring the soup up to a simmer. Once your soup is at a since simmer add the lentils. Cover the pot and allow the soup to cook for 45-60 minutes until the lentil are tender. While the soup is simmering you can take this time to grate the Parmesan cheese. Here is a cool little tip. When you get to the rind of your cheese, don't throw it away! Save it and you can add it to your soups and sauces for a little extra flavor. Just be sure to remove it before serving. Once your lentils are nice and tender add the kale. Once the kale has wilted, add the grated Parmesan cheese. Stir it into the soup until it has melted. Taste for season and make any adjustments you feel it may need. This soup is not only hearty and filling, but the flavor is out of this world and it is stunning! Pardon me while I take a bite now! Mmm, the lentils are nice and al dente, the carrots are soft and sweet, the sausage beefy and filling, and the kale just sets everything off. Oh, and don't forget that cheesy finish on every bite because of the Parmesan you added. This soup is definitely one of our winter favorites and I know it will be one of your as well! 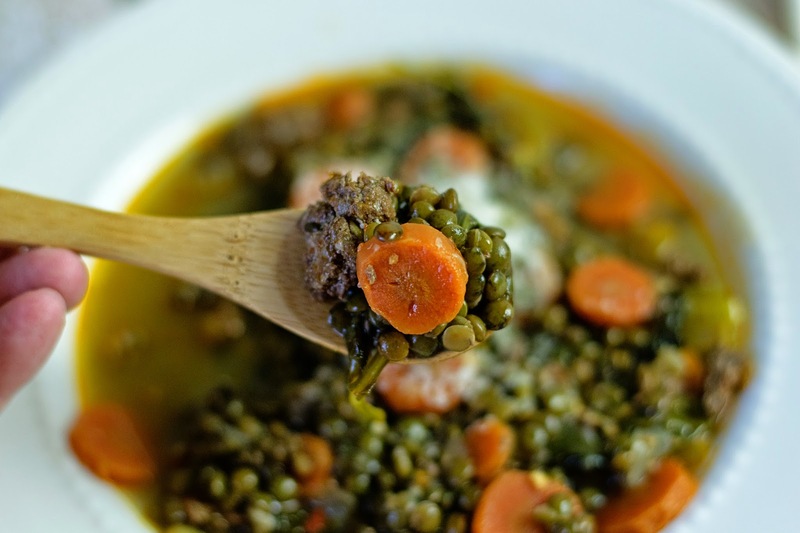 So get in the kitchen and make this beautiful Italian Lentil Soup tonight! Place a heavy pot over medium/high heat and add 1-2 tbsp. of oil. Once the pan is hot, add the onion and cook until it becomes soft and translucent. Next, add the sausage and cook until brown and no longer pink. Once the sausage is fully cooked add the carrots, celery, garlic, and thyme. Cook the vegetables until the begin to become tender. Add the chicken stock/broth and bring to a simmer. Once the broth has come to a simmer, add the lentils. Simmer for 45-60 minutes until the lentil become tender. While the soup is simmering, grate the cheese. Once the lentils are tender, you can add the kale. Once the kale has wilted you can add the cheese. Stir until the cheese has melted and taste for seasoning. Make any adjustments you feel it may need.